Vintage Original Red Singer Toy Sewing Machine Model 20-10 by Singer Sewing Machine Co. made from 1954 thru 1957. This little machine is sometimes referred to as a Sewhandy. A Red Singer Toy Sewing Machine is HARD TO FIND because there were not than many of them made like the black or tan/brown toys. Most of these red machines were made in Monza, Italy. 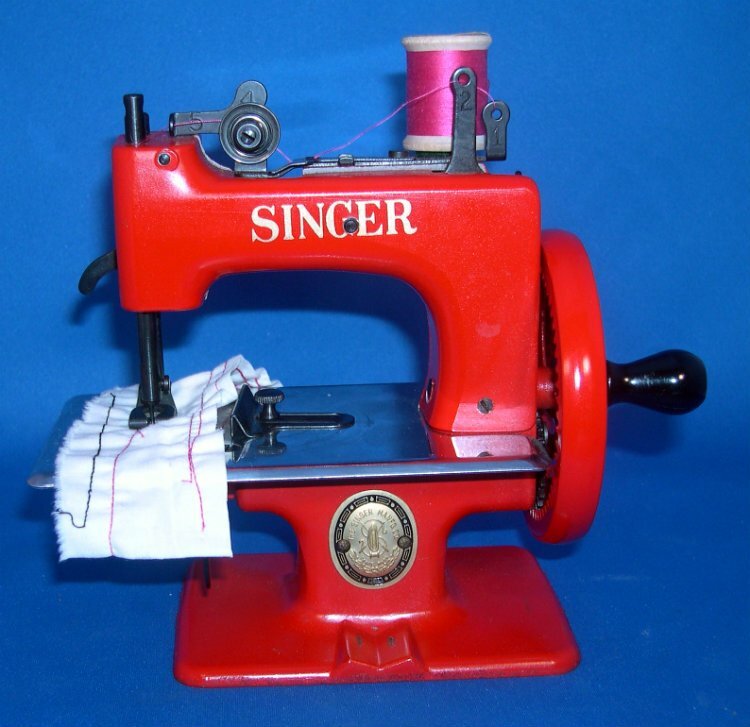 This little machine has Singer in large capital letters, has a gold and black medallion, a nickel plated sewing plate, a numbered thread assist, a rectangular base and 7 spokes in the wheel. The machine has black fittings (sew bar, foot, seam gauge, etc.) rather than the nickel plated fitting on the black or tan/brown toys. It sews a chain stitch as shown in one of the pictures. During our years of collecting toy machines we discovered that there are actually two different colors of Red Singer Toy Machines. This one is the closest to a tomato red color. The other red is a darker, true red and is very rarely found. There are no scratches or rust. The area where the clamp fits does show that it has been used but not much. With this Red Singer you get the box which is in good condition, an original Singer red clamp and a set of instructions. Would make a very nice Christmas present or Birthday present for someone. Kept in a smoke free, pet free environment. The machine will be carefully packed and insured.